Vodou is among the most misunderstood and maligned of the world's religions. Mama Lola shatters the stereotypes by offering an intimate portrait of Vodou in everyday life. 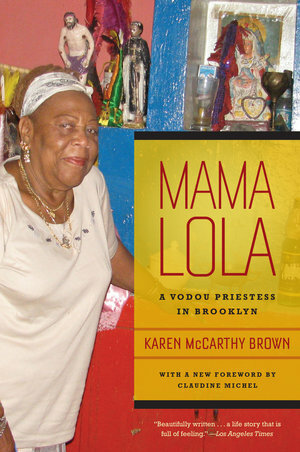 Drawing on a 35 year long friendship with Mama Lola, a Vodou priestess, Karen McCarthy Brown tells tales spanning five generations of Vodou healers in Mama Lola's family, beginning with an African ancestor and ending with Claudine Michel's account of working with Mama Lola after the Haitian earthquake. Out of these stories, in which dream and vision flavor everyday experience and the Vodou spirits guide decision making, Vodou emerges as a religion focused on healing brought about by mending broken relationships between the living, the dead, and the Vodou spirits. Deeply exploring the role of women in religious practices and the related themes of family and of religion and social change, Brown provides a rich context in which to understand the authority that urban Haitian women exercise in the home and in the Vodou temple. Karen McCarthy Brown is Professor Emerita of the Sociology and Anthropology of Religion at the Graduate and Theological Schools of Drew University. Claudine Michel is Professor of Black Studies at the University of California, Los Angeles.